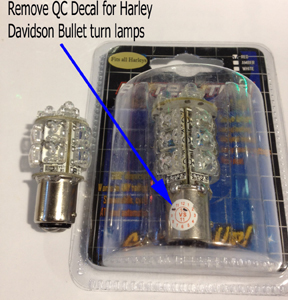 This bulletin is intended to help intermittent installation related issues associated with installing a Brite Lites brand 360 degree LED in the newer Harley directional lamp housings, like on a 2006 and newer SoftTail. Any HD bike with the slim chrome bullet style turn signal housing. It is important to review this picture and remove the Quality Control decal from the metal base prior to installing the new LED lamp into the bike. Harley has recently relocated the ground pickup on these type of turn lamp housings and the QC decal on our Brite Lites 360 degree 1156 and 1157 models in all colors, can cause the light to go out when completing the final twist and lock, during installation. If you have installed these into HD bikes and the LEDs are operating properly, there is no issue or need to remove decal. It will only happen when installing the LED and locking it into place. If the problem exists, all that is needed, is to take a utility type knife and remove the decal from the base of the LED lamp and re-install. In all cases, this will fix the problem. The decal is a white vinyl material and all of the decal and adhesive should be removed before reinstalling. All future production will have the decal relocated so it does not interfere. If the LED you are using has the same decal as shown, keep this information in mind when installing.